This page is about the British medium tank Sherman Firefly. For the British tank with a similar name, see Sherman II. The Sherman VC Firefly is a Rank III British medium tank with a battle rating of 4.7 (AB/RB/SB). It was introduced along with the initial British tree line in Update 1.55 "Royal Armour". One of the most famous Sherman modifications in World War II, the Firefly introduces the potent 17-pounder anti-tank gun as the main armament of the Sherman platform, presenting a very drastic increase in firepower over the original 75 mm gun. This variant, the VC, was based off the chassis of an M4A4 Sherman. The Sherman Firefly is easily distinguishable by its very long gun, even compared to the Shermans with the American 76 mm guns. The muzzle brake on the cannon is also in a spherical shape rather than a horizontal rectangular shape so that is a distinction between the 76 mm cannon and the 17-pounder. The hull is resemblent to that of the M4 Sherman although lacking the bow machine gun (it's actually based off an M4A4). The turret is also very similar, although the radio sticks out of the back in a bustle. This tank should be the supporting line in both offensive and defensive actions, providing flanking fire, long-range fire, or fast and accurate fire to the target while the heavy tanks take up the brunt of the defense. The tank is as mobile as the M4 Sherman, so picking up speed to get around the enemy is not hard. Those familiar with a M4 Sherman control will pick up on this tank very easily. While this tank is also capable of being the frontal attack unit for an assault, it is strongly advised to not due to the thin armour of the tank, necessitating the users to always get the first shot off in an encounter, otherwise the enemy will be able to destroy the Firefly easily. For a conservative, almost TD-like role, it can also perform, destroying tanks from afar. Access to the Add-on Armour modification will give the tank substantial coverings on the side hull, each track being 17 mm thick. The bow machine gun area has been welded shut with armour, but is only 25.4 mm thick so may present a viable weakness to weaker enemies. Unlike the armour on the American Rank III Shermans which saw itself upped from 50.8 mm to 63.5 mm, the British Firefly in Rank III retains the old 50.8 mm base armour thickness on the front hull, as well as the protruding driver and co-driver hatches in front. This makes the Firefly a much more vulnerable Sherman tank than even the American versions, a trade-off for its more powerful armament. Ammo rack of the Firefly. Shoot and scoot. Unless the enemy's tank gunner has been knocked out (black only), cannon breech has been disabled (red/black), or cannon barrel is disabled (red/black) that inhibits the enemy's ability to fire back, don’t expose the tank after firing. Always try to retreat back into cover to relead. Once reloaded, preferably pop out of an area different from the last firing position and take another shot. Make sure to eliminate the enemy's ability to fire back by destroying their cannon breech and traverse gears, or incapacitate their driver and gunner again if they were replaced. During this whole process, watch out for other enemy tanks and avoid being swarmed. 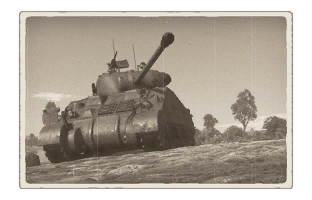 With situational awareness combined with the correct usage of the map, the Firefly becomes a decent tank capable of effectively fighting every medium and heavy tank it faces. The Firefly can excel at vaporizing tanks that have clustered crew, like StuGs, SUs, T-34s, KVs, and even Panzer IIIs and IVs. The post penetration affect of the Firefly's shells after the AP buffs allow it to decimate those tanks. However, it is recommended to still shoot from afar, as all of these tanks can destroy the Firefly easily. Definitely do not play to aggressively. The huge weakness of the 3/4 crew in the turret is almost always pointed out immediately, because it's a huge issue. It good hit either means a quick trip back to the hangar, or a lengthy crew replenishment time on AB. But this ignores the fact that the tank is just a huge glass cannon, as any shot anywhere will likely cripple the tank. The Sherman Firefly can dish out the punishment necessary for heavy tanks, but can’t take it. Don’t expose the tank towards enemy fire too long due to the thin armour on the Firefly in comparison to other tanks such as the Russian T-34-85s and the Germans Panthers. Take a shot, preferably from a flanking location, then retreat into cover regardless of the shot's effect on target, because if the target could swing its gun towards the Firefly, or have friends that could hit it, consider writing off the Firefly very soon. This varies between different enemies, as going against something like the KV-2 would be different than going against a Tiger I. As per usual,"Parts" and "FPE" should be the focus first for modifications to increase combat survivability. Everything else is fair game after those two. However, for AB players, Crew Replenishment is extremely useful as it gives a second chance if all of the turret crew are knocked out. Uses the tried and tested Sherman chassis. Experienced players will find this tank easy to use. Very fast turret traverse speed. The 17-Pounder gun, which can penetrate every single tank it faces, although newer players may struggle against the Panther. Fast reload even with untrained crew. Access to additional armour that covers most of the front and sides. Has .50 cal AA machine gun that's unique among other vehicles as it can rotate for 360°. Has no side bulges unlike the Premium version. 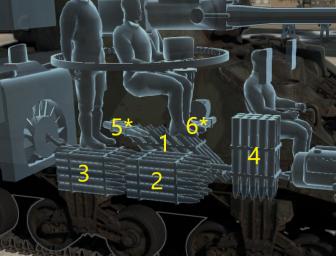 Post penetration damage tends to be enough to knock out crews when clustered together, such as on the T-34 series or turrets. Armour of a M4 Sherman, very thin for a Rank III vehicle. 4 crew members, 3 of which are clustered in the turret, making it easier to knock out. Bad gun depression of only -5 degrees. Gun post penetration damage is decent with the AP buffs, but still won't always one shot a tank. Smart enemies will shoot the spot where the radio operator gunner usually sat, as in the Firefly, that spot is replaced by ammo (unless carrying 54 ammo). Additional armour doesn't really help. Like all vehicles armed with early version of the 17-pounder gun, it will struggle before it has the Shot Mk.8. Stock AP round is painful to use. It fragments poorly, bounces often and does very little damage unless hitting ammo or modules. 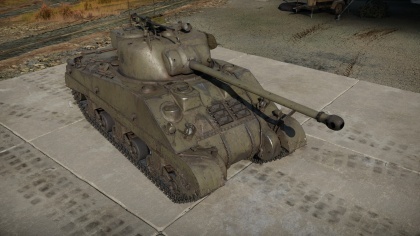 Unlike other Shermans, it doesn't have access to a gun stabilizer and thus the gun sight will rock up and down on a sudden stop. Around 1943 in World War II, the M4 Sherman was one of the best tanks in use by the Allies. It superseded the German standard Panzer IIIs and Panzer IVs at the time. However, it was during the middle of 1943 that the Sherman design was beginning to wane in superiority with the reveal of newer German tanks in the front lines, namely the Tiger I and the Panther tanks. These tanks are able to not only take out the Sherman at a longer range than the Sherman can compete in, but could also withstand the 75 mm rounds fired from the Sherman with their frontal armour. In order to improve the Sherman’s firepower against these better German tanks, the Americans decided to upgun their tanks with the better 76 mm gun. The British, however, decide to up the ante with one of the Allies’ most powerful anti-tank gun at the time, the 17-pounder. The Ordnance QF 17-pounder was a 76.2 mm anti-tank gun developed by the United Kingdom around 1942, but was considered as far back as 21 November 1940. The British predicted that the Germans would be increasing their tank armour gradually to make current anti-tank weapons ineffective in North Africa, a lesson learned when their issued 2-pounder, 6-pounder, and 75 mm guns were meeting heavier armoured tanks, and even tanks with superior firepower like the 75 mm KwK 40 on the Pz.Kpfw. IV Ausf. F2. The first prototype batch was completed in Spring 1942 and the design was finalized in 1943 and accepted into service that same year, where it would see great effect in the Italian Campaign as one of the best Allied anti-tank guns. One of the reasons why the 17-pounder was so effective was the use of the APDS shot (Armour-Piercing Discarding-Sabot), which could penetrate up to 256 mm of armour at 500 meters distance; this is due to the smaller, but much faster projectile used that contains more kinetic energy than a full-sized shot. However, drawbacks with this ammunition was the lack of tracer to be able to adjust shots, the inaccuracy beyond 500 yards, and the less damage it could cause to the enemy tank. The 17-pounder effectiveness against the new German tanks and the lackluster anti-armour firepower on British tanks brought upon the concept of mounting the 17-pounder onto tanks. The first mention of mounting the powerful gun onto a tank carriage was as early as 09 December 1941 by Tank Board, which prompted the design specification A29, a 45-ton 17-pounder armed tank that was eventually cancelled for another design. The next design took the Cromwell tank as its basis, with development proceeding in 1942 as the A30 (later known as the Challenger). While A30 was in development, the prolonged development time had Tank Board set up for two more 17-pounder projects, the A34 (Comet) for a short term project and A41 (Centurion) for a long term one, in the summer of 1943. However, in the same year, a side project for a 17-pounder tank was conducted by two officers. Royal Tank Regiment major George Brighty, based at the Royal Armoured Corps Gunnery School at Lulworth in Dorset, had the belief that the M4 Sherman was a better tank mount for the 17-pounder than the A30, which was being tested in Lulworth. He experimented around an acquired Sherman, though came to a conclusion that the turret size was too small for the 17-pounder’s breech and recoil. Still, he persisted in his efforts and in a rather absurd solution, fitted the 17-pounder into the turret by locking the gun into the mounts and removing the lengthy recoil system, forcing the tank’s mass and suspension to absorb the entirety of the 17-pounder recoil. Though this proved to have worked, the modification was far from ideal for any practical usage. During his trials, Brighty joined up with another major of the RTR by the name of George Witheridge. Witheridge was also convinced of the Sherman’s virtues from his time at Fort Knox when advising on tank gunnery techniques. While he appreciated the dual-purpose usage the 75 mm gun on the Sherman provided, he was concerned on improving the armour-piercing properties while retaining the same high-explosive charge. Witheridge arrived at Lulworth to Brighty’s design, which he found unsuitable. In a statement on how confident such a design looked from the outside, Witheridge test-fired Brighty’s 17-pounder Sherman from the outside three times before trying it out inside. Priority soon shifted to develop a recoil system for the Sherman-mounted 17-pounder. However, some time after Witheridge’s arrival, the Department of Tank Design (DTD) sent a directive to the two lads to cease their development on the up-gunning of the Sherman, possibly to protect their A30 project. Witheridge, still keen to the idea of using the Sherman, tried to get this directive reversed by appealing to his connections, namely a man going by Major General Raymond Briggs. Briggs, Witheridge’s commanding officer in North Africa and also enthusiastic about improving British tank firepower, put the word to Claude Gibb, Director General of Weapon and Instrument Production at Ministry of Supply, to which Gibb approved and the 17-pounder Sherman was back up. However, with the Ministry of Supply now involved with the project, the design was shifted from two enthusiastic officers to the engineers. One person deemed responsible for completing the project was W.G.K. Kilbourn, a professional engineer at Vickers who was stationed at Chertsey when he was assigned the 17-pounder Sherman by the DTD. He managed to fit the 17-pounder gun into the Sherman turret by extensively modifying the gun. He replaced the recoil cylinders with shorter ones mounted on the sides, opposite to each other top and bottom, on a special cradle, modified the gun barrel to fit onto the cradle for better support, and placed the gun breech to open horizontally (contrary to the statement that the gun was simply rotated 90 degrees sideways as the operators of the gun have not been rotated along with the breech). The redesigned 17-pounder, named Mk IV was built on 11 November 1943 at the Royal Ordnance Factory and could fit into the Sherman turret, but now the concern was on the crew inside. The large breech of the modified 17-pounder ate up a lot of internal space and isolated the loader on the left side of the gun and turret; the solution was to cut a hole on top of the loader’s position and add a hatch. The radio, usually mounted on the rear of the turret, was deemed too close to the recoiling breech for comfort so an armoured box was welded to the turret rear for the radio and a hole cut into the turret rear for operating the radio away from the recoiling gun. The armoured box also had the benefit of acting as a counter-weight for the longer and heavier gun for the turret. Finally, there was an issue of ammo stowage for the larger and heavier 17-pdr rounds, 6 inches longer than the 75 mm shells. The stowage on the tank was in bins in the turret for ready access, but a bulk of it was placed under the turret floor that could only be accessed when the turret was aligned a certain position for each bin, making them more for replenishing the ready racks during breaks in combat. To increase the stowage for more 17-pounder rounds, the bow machine gunner was removed along with his machine gun (the port welded over by a prominent wedge shaped armour) and a rack holding 15 rounds placed in his location, however the position for the rack was also impossible to reach during combat and one location on the rack was so hard to get to that it wasn’t used, making the total stowage 14 rounds instead. Kilbourn efforts and those of assisting engineers managed to finally fit the large 17-pounder gun into the constrained space of the Sherman turret intended to mount the 75 mm gun, as well as perform the necessary modifications to accommodate combat usage of the vehicle. It then moved onto the next stage of being approved for service. Inspection of the completed Sherman with the 17-pdr started on 06 January 1944, and the War Office wrote a requirement for up to 2,100 of the tanks to be upgunned. Not every Sherman could follow the conversion, whether by technical or logistics limitations, and only petrol-engined, M34A1 gun mounted, and have a hydraulic turret traverse system. This meant that the Shermans converted were the Sherman I (M4),Sherman I Hybrid (M4 "Composite") , and Sherman V (M4A4). Technically the Sherman II (M4A1) and Sherman III (M4A3) were also eligible for conversion with those standards, but information on the Sherman II are scarce and photographic evidence of cast hull converted Shermans usually turn out to be Sherman I Hybrids; Sherman III are all allocated to the U.S. Army as their mainstay tank so no M4A3 were even available in British service to convert. Tanks armed with the 17-pounder were designated by a "C" in the name at the end of their mark number, leading to names such as the "Sherman VC" to denote a M4A4 with the 17-pounder conversion. Troops with the upgunned Sherman, as early as March 1944, were describing tank as a Firefly, regardless of the type. How it got the name is debatable, but it is most likely due to the very prominent muzzle flash that the 17-pounder produces when firing. Still, as D-Day approached for the Allied forces and the A30 Challenger was continually delayed, the eagerness of the troops to acquire the Firefly rose substantially. Four factories were prioritized for the conversion, two at London, one at Manchester and another at Nottingham. From the conversion period of 1944 to 1945, up to and between 2,100 to 2,200 Fireflies were converted, making it the most produced tank with the 17-pounder of the war. Allocation of the Fireflies was one troop per three Sherman troop (troop was an equivalent of platoon and consisted of 4 tanks), but even regiments that were equipped with Cromwells were supplemented with Fireflies until the A30 Challenger was fit for service. The Fireflies were also allocated to Canadian and Polish regiments. Due to the relative newness of the Firefly, most of the training done on the utilization and deployment of the Fireflies were done on the combat field by each regiment. The Firefly’s first combat action on D-Day was not actually on the land of Normandy, but on the sea. The Firefly’s were assigned an unusual role to, while on the LCT that would carry them to the beaches, would fire over the berm towards concrete fortifications and blast them with the 17-pdr. Six Fireflies were allotted, separated into pairs, to DD tank regiments of the British 13th/18th Hussars at Sword Beach, and the Canadians 1st Hussars and Fort Garry Horse at Juno. Though 13th/18th Hussars were reported to not have fired their Fireflies on the way in, 1st Hussars seemed to have good experiences with it in the rough weather. Once the LCT reached the shore, the Fireflies were ordered to disembark and head inland, finishing off obstacles and join their original tank regiments. The first non-DD tank regiment with Fireflies to land was the Staffordshire Yeomanry, which had at least 12 Sherman VC with 48 Sherman IIIs, however little information exists on how it performed on the opening days of the Normandy campaign. Other regiments were originally DD tanks with Fireflies, but were employed as regular tank regiments once inland. One of such regiments was the Sherwood Rangers Yeomanry. It was they who, a few days after the landings, deduced that the Germans seemed to be targeting their Fireflies specifically for their longer guns. Though this deduction was not supported by evidence (19% of total Fireflies were lost, but 29% of regular tanks were lost as well), the concern of Firefly loss was great because of the supply issue. As illustrated that though 22 Fireflies were lost, by June 23 only six replacements had arrived. Experience from the ground and the density of heavy German tanks changed some initial organization of one Firefly troop per three Sherman troop into one Firefly per tank troop. Fireflies were in such high demand that some commanders have expressed thought of obtaining the 17-pdr armed M10 as supplement. Still, the units acquiring the Fireflies appreciated what they had as it was the only tank in Normandy in the Summer of 1944 that had a reasonable chance of defeating a Panther or Tiger at combat ranges in the front. In fact, the Firefly is most likely the responsible tank that destroyed the Tiger tank containing the Tiger Ace Michael Wittmann on 08 August 1944. Once Firefly supply to the Normandy campaign was satisfied in October 1944, Fireflies were allocated to the Italian theater, shared out to the Polish, Canadian, New Zealand, British, and South African regiments stationed there. With that, supply issue arose in that theater for the Firefly, causing the units that received the Fireflies to treasure them greatly. Heeding the comments on how Fireflies were singled out for their long guns, there were attempts to hide the prominent gun barrels, ranging from deceptive paint schemes, camouflage, and even dummy barrels on the back of the Firefly turret that would be pointed forward to mimic the short 75 mm gun. Still, the Firefly served in the British Armies in the European Theater of Operations up to and until May 1945, when they were retired along with the end of the war for the replacement of better designs like the Comet cruiser tank and the Centurion tank. The Firefly’s performance was very favorable for the troops that had to use them against the heavy German tanks. Though a good portion of Germany’s armour in the Normandy front were Panthers, a good majority were still Panzer IVs and self-propelled guns, all of which were manageable even with the 75 mm guns. Field reports by a Colonel W.E.H. Grylls in 1945 helped highlight the troop’s sentiments on the Firefly in combat, and especially their deficiencies. The muzzle brake sometimes came loose from an inadequate locking design, the traverse gear also failed at times due to the extra turret weight from the gun, rain leaked into the radio box on some tanks, internal space for the Firefly turret crew was comparatively cramped to the Sherman’s, the muzzle flash at the gun’s muzzle brake can obscure the target enough that it is difficult to ensure the firing round hit it, and muzzle flash on the breech end of the gun inside the turret has a tendency to cause a fair share of discomfort and uneasiness for the crew. Grylls also highlighted the crew praise on how the Firefly tended to not catch fire as quickly as Shermans, though this is deduced to by the placement of the majority of ammunition on the bottom of the hull, like the “wet stowage” arrangement on the newer Sherman models. Some of the deficiencies were fixed, such as the flashback at the breech end by implementing a delayed action breech on the 17-pounder Mk.VII model, but all these faults never diminished the popularity of the Firefly, highlighted by the statements of Field Marshall Bernard Montgomery that he wished to have Fireflies replace all types of Shermans in British service. On the onset, the Americans were not enthusiastic about the Firefly because they believed they had a comparable design in the 76 mm armed Shermans. It was not until Normandy when they were proven wrong and learned the 76 mm were unable to contend against Panthers from the front. Though they soon developed the HVAP ammunition, General Omar Bradley’s 12th US Army Group on 13 August 1944 requested for Fireflies to be made until better American armament like the 90 mm could be fielded. Due to supply constraints, they never received any during that time period. Not that the American’s own industries were making the situation easier for the British as when they discontinued their M4A4 Sherman and 75 mm gun production, there was a quick drop in Firefly conversions in the latter part of 1944 until they could supplement the production with enough Sherman I models. In the American’s own program, it was advised that they try mounting the 17-pounder in the T23 turret made for the 76 mm gun, but also mounted on the T26 chassis. This advice did not make much progress. It wasn’t until February 1945 when the British finally made time for conversions for the Americans. The first trials were converting two M4A3 Shermans to fit American specifications like fitting their larger radios, adding stowage brackets for the M2 machine gun, and attachment of a M9 elevating quadrant on the gun cradle. A request of 160 Fireflies were specified on 11 March 1945 for completion on April 30, with the Americans shipping suitable tanks from France back to England for conversion. On April 7th, the initial order was halved to 80 due to the incoming end of the war and its demand ending with the lack of encountered German armour after the Ardennes Offensive. On the war’s end, there were 100 tanks sitting in depots ready for conversion, with 86 converted tanks. The excess Shermans were given away and the leaders were left on what to do with these Fireflies they no longer needed. It was decided on May 26 that these American Fireflies were to be retained in Europe for equipping the occupational force. No evidence exist on what happened to these Fireflies past that point. The Firefly’s reputation during and after the war is a product of hindsight. The British understood the trend that was happening in German armoured forces and acted accordingly with the 17-pounder. It should be noted that the 17-pounder’s super round, the APDS, did not appear in Firefly stowage until August 1944, and in combat was really inaccurate past 500 yards and the round fouled the barrel that it affected follow-up shots with APCBC rounds. As such, APCBC round would still be standard usage and though the 17-pounder was still slightly more powerful than the 76 mm, it traded crew comfort and design quality in the Firefly in comparison to the 76 mm gun in the larger T23 turret. What solidified the Firefly’s place in history in comparison to the 76 mm Shermans was that on the very first day that the Allies invaded Normandy, the British actually brought the Fireflies while the Americans left their 76 mm guns in English depots. Thus, the British can claim with great confidence that on the opening days of Operation Overlord, they had a tank that could kill the German cats. ↑ Fletcher 2008, What’s in a Name? Morans, Nicholas. Inside the Chieftain's Hatch: Sherman VC "Firefly" part 2 YouTube, 20 Mar. 2017. Web. 29 Mar. 2017. Firefly «Scorpion» - Gift version of the vehicle, representing the 2nd «Warsaw» Armoured Division. M4A4 (SA50) - France's post-war attempt to upgrade the Sherman similarly to the Firefly. This page was last edited on 20 March 2019, at 02:45.